Participants in the Near-Space Balloon Competition, representing 10 different schools around the state, launch payloads on the tail of a high-altitude balloon. It’s the culmination of months-long projects conducted by middle and high schools with the assistance of North Dakota Space Grant Consortium, which is based at UND. Image courtesy of North Dakota Space Grant Consortium. The North Dakota Space Grant Consortium likes to keep things current for the kids. Now in its eighth year of administering the Near-Space Balloon Competition (NSBC), coordinator Marissa Saad wanted a theme that was relevant to 2018. This year marks 60 since the inception of the National Aeronautics and Space Administration, better known as NASA. Saad found it a perfect way for middle and high school competitors to get creative. 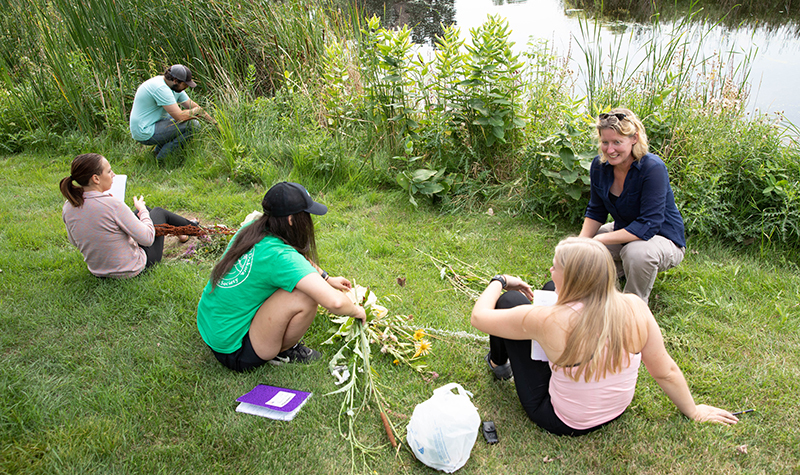 The NSBC is a hands-on experiential learning program organized by Saad, fellow coordinator Caitlin Nolby and graduate student Denise Buckner in UND’s Space Studies program. Each year, schools around the state have students from grades 6 through 12 participate. Their mission: create an experiment, create a payload that can test the experiment, then send that payload aboard a high-altitude balloon to the reaches of Earth’s atmosphere. On Saturday, two high-capacity balloons launched from South Kiwanis Park in Grand Forks, each with six attachments in tow. Afterward, teams digitally tracked them from UND’s Robin Hall. Images and video captured by student-crafted payloads never become less breathtaking. Marissa Saad (center) was back and forth during Friday evening’s “integration night” making sure groups were on schedule. At UND’s Robin Hall, students finalized their experiments and rotated through educational sessions around the building. 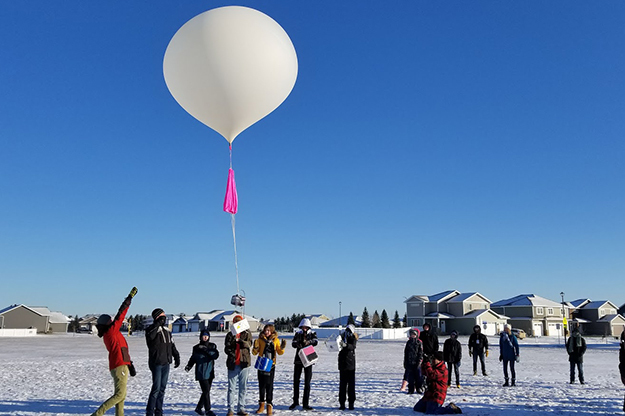 Space Studies graduate students gave mini-lectures on the equipment behind ballooning, predicting the flight path of their experiments and how they monitor launches in real time. Photo by Connor Murphy/UND Today. Ten teams entered this year’s competition, a number Saad says is growing every year. To celebrate NASA’s 60th, Saad instructed them to craft an experiment that had something to do with the mission, goals and inspirations of NASA. Approximately 140 people—students, teachers and chaperones—converged on campus for Friday’s ‘integration night.’ Teams orally presented their experiments in Clifford’s second-floor lecture hall then traversed the tubes to Robin for a two-hour workshop session led by graduate students. Buckner, a Space Studies graduate research assistant, has headed up workshop efforts for two years now. Thanks to the graduates, Friday’s activities ran according to plan. At the main workshop, each team had a table where judges evaluated their aptly decorated payloads and weighed them to ensure adherence to the two-pound limit. Once cameras and sensors received a final test, payloads were deemed ready for launch integration – tethering them with rope for eventual connection to the balloons. It also created an opportunity for judges to follow up with teams following their brief presentations. Then groups broke out into varying sessions. Students got a closer look at the hardware necessary for launching a balloon nearly 20 miles into the sky; how they would be tracking their payloads the following morning; and software that could predict the balloon’s path using inputted variables and atmospheric conditions. The staircase at Robin Hall also proved a fitting model for layering the atmosphere, demonstrating what the balloons would encounter on their ascent. Through Buckner’s experience, it’s most rewarding to see students out in the field and seeing their work in action. “When you have students come in that haven’t been exposed to this kind of research, and seeing how excited they get about what they’ve built and seeing it launch, it’s always great,” she said. 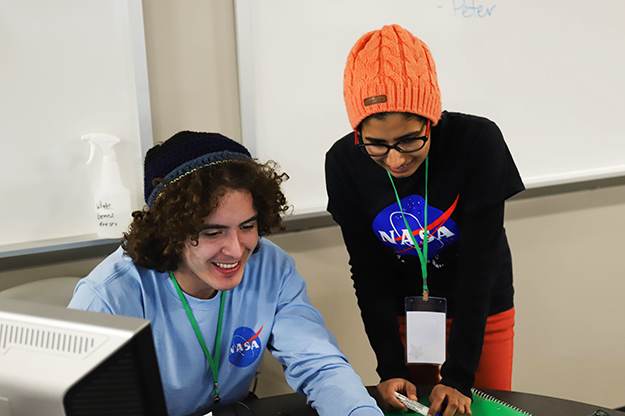 UND Space Studies grad students Peter Henson (left) and Anamika prepare to assist student groups with their experiments’ on-board computer requirements. 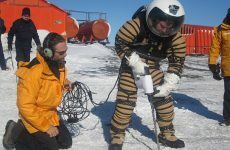 Cameras and sensors on payloads needed mini-computers to execute the mission of data collection. The grad students aided teams by writing code and troubleshooting computing issues before launch day. Photo by Connor Murphy/UND Today. 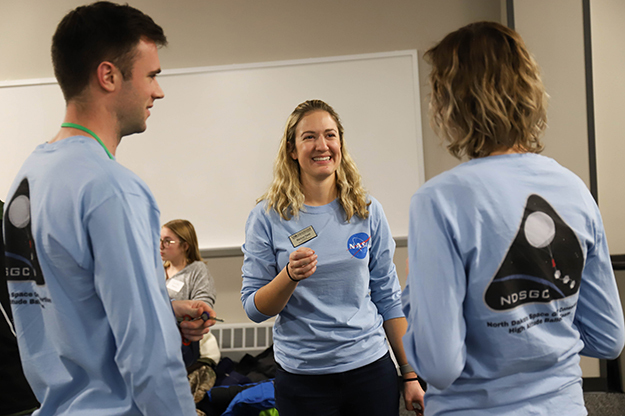 The NSBC is designed to be much more than a competition, as North Dakota Space Grant’s goal for education outreach is to teach young thinkers how to be scientists. They work with school faculty to teach team members how to write proposals, record results and write reports on their findings. Awards are decided after teams submit their final reports next month. Given the range of ages able to compete, Saad says NSBC is about how they design and compose their proposed experiments as a team. North Dakota Space Grant also provides the experience of coming to UND as an all-inclusive excursion; they cover travel, lodging and accompanying expenses for those coming from communities as far as New Town and Bismarck. Space Grant also reimburses teams for up to $250 spent on constructing payloads. It’s all an effort to impact the youth perception of science.